When a boy can't stop sucking his thumbs, a tailor cuts them off with scissors. A little girl who plays with matches is burned to ashes. And Saint Nicholas catches three children making fun of a dark-skinned boy, so he dips the offenders in ink. German psychiatrist Henrich Hoffmann's 1845 Der Struwwelpeter ("Shockheaded Peter") consists of ten moral tales, ostensibly for children 4 to 8, with the dire consequences of disobedience made all too clear. 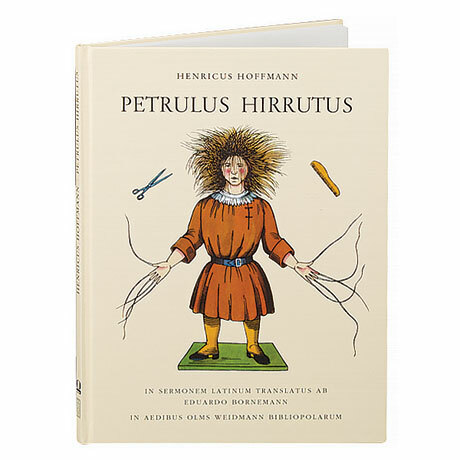 This classic appears here in Latin with the original German text in an enclosed booklet, but even if you don't know either language, Fritz Kredel's cheerfully macabre illustrations are entertaining and unforgettable.